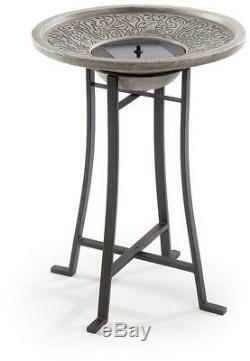 The Perello Distressed Grey Cement Solar Birdbath Fountain creates a relaxing atmosphere in your garden, on patio or balcony. 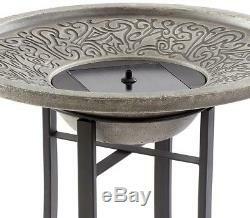 The distressed grey cement fountain has a beautiful design around the edge of the bowl. The fountain itself bubbles as a way to keep the water fresh. Birdbath is solar powered and there are no wires or electric source required. The hidden reservoir keeps the water flowing. Creates a relaxing atmosphere in your garden or on your patio or balcony. Distressed light cement on powder-coated black steel frame. Operates in direct sunlight only. Bubbler and 360 spray toppers included. Recycles water from a hidden reservoir. Assembled Dimensions: 20.5 in. L x 20.5 in. W x 28.3 in. Water capacity: 1.5 Gal. No wiring, simply install and enjoy. Bowl Diameter: 20.5 Product Depth in. : 20.5 Product Height in. : 28.3 Product Width in. 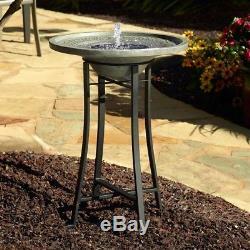 The item "Smart Solar Birdbath Fountain Distressed Grey Cement Stone Outdoor Garden Patio" is in sale since Saturday, September 1, 2018. This item is in the category "Home & Garden\Yard, Garden & Outdoor Living\Ponds & Water Features\Outdoor Fountains". The seller is "epicdeals2919" and is located in Luckey, Ohio. This item can be shipped to United States.